Raise your hand if sometimes you just want to give up. I know you’re trying really hard to heal yourself. I did too. And my current clients are some of the most disciplined people I’ve ever known. They’re doing everything they can to heal and see positive results. But to be fair, the process is exhausting. Especially when you’re on your own. I had days when I felt like I was in a black hole. Especially when I experienced a setback. PS: I wrote a blog post all about how chronic pain affects you mentally and also included some resources to help you in your journey. Make sure to read that post when you’re done this one. You can find it here. Here’s the thing though. NOTHING happened in that dark zone. That feeling of hopelessness just makes everything worse if you’re not able to snap out of it. 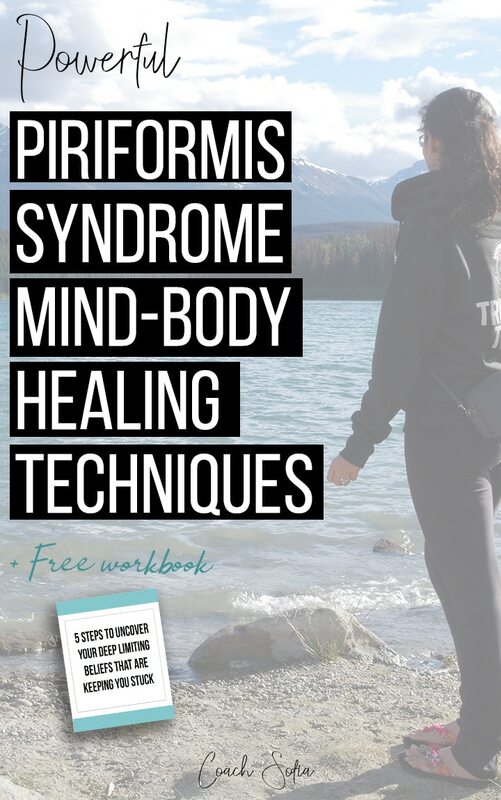 If you’re suffering from chronic muscle pain, piriformis syndrome or any stubborn chronic injury… Stick around on the blog today because I have for you a powerful video that’ll challenge you, give you hope and show you help you build an ironclad empowering mindset to support you through this journey. I’ll also show you a powerful mind technique I’ve used that helped me recover faster. I invite you to have an open mind and just give my suggestions a try. Below the video, you’ll find the list of resources promised in the training video. I’ve also created a workbook to go with it so you can do the exercises mentioned in the video. Download the workbook below the video. The first step is to pinpoint exactly what beliefs you’ve developed that are currently hindering your progress. Use the “5 Steps To Uncover Your Deep Limiting Beliefs” guide to help you and guide you. If you follow this process you’ll pinpoint exactly what those limiting beliefs are. Please don’t skip this step. I know it’s unconfortable. But you’ll be amazed to see how these beliefs have been shaping every decision you make and also every action you take to heal your body. For example, one of my limiting beliefs was that my body was my ennemy and I couldn’t trust it because I couldn’t predict flare-ups. And as a result, I would skip my exercises, feel anger towards myself, feel like I can’t trust anyone (because I can’t even trust myself). One belief had a huge impact on my whole life. And there are SO many of them in each area of your life. If you’re telling yourself that there is no point in doing this because you have NO limiting beliefs. I’m here to challenge that. Just go through the guide and see for yourself. If you’re experiencing ANY resistance in getting healthier or taking certain actions, there is a limiting belief behind that. The only way to do this is to go through Step 1 first. And if you’re having trouble even believing in your ability to heal yourself (it usually happens when you’re in chronic pain for years), then I would collect as many success stories as possible. I used to search the internet for people who were able to heal from the rarest conditions where they’ve been told they were no cure. It doesn’t have to be back pain. It can be anything. The story has to inspire you and fascinate you. You need to start feeling hopeful that it can also happen to you. That’s how you start to break free from the belief that you can never heal. And of course, this blog is here to inspire you as well. Now it’s time to start reprogramming your mind to feel normal again through visualization. If you haven’t felt pain-free in years, your body has built neural pathways associated with pain. And you need to create new ones. Of course not. But why? You’ll tell me because you may make yourself sick, right? Well, why on earth wouldn’t you do the complete opposite to heal yourself and get better? Athletes have always been known to visualize their success before them winning. When they visualize winning before a game and all the details associated with that, they build confidence in themselves that it can be done. They play with ease and when they do win, it feels just like a deja-vu because they won in their mind before making it a reality. Below you’ll find some amazing books I read on visualization and mind-body healing. Full Disclosure: this post contains Amazon affiliate links. If you purchase from the Amazon website, I get a small commission from them, you won’t pay more. Thank you for supporting this blog!